Resolved: Jurassic World’s human characters are less human than its dinosaur characters. Its script stinks. And it may have sunk its 3.5-inch heels into some abysmally retrograde gender politics. And yet … critics extended a reasonably enthusiastic thumbs-up, and the movie earned half a billion dollars around the globe this weekend. In the parlance of summer movies, it worked. You’ll find no bigger Jurassic purist than me, and I left the theater Friday smiling and humming the classic John Williams theme. By Sunday, I was back in the theater again. 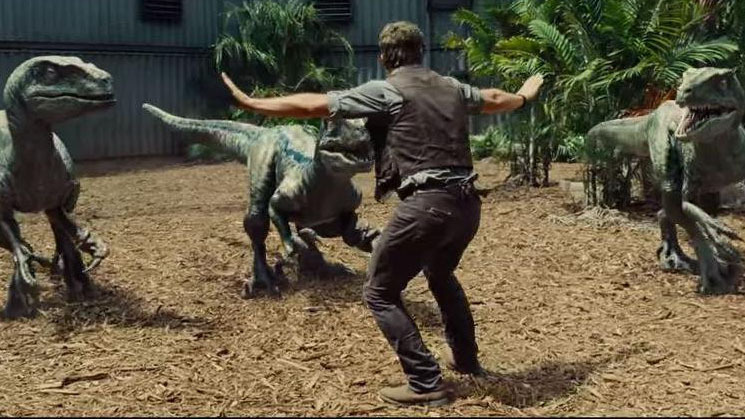 Why Jurassic World worked is an interesting question. On the simplest level, the world had waited 14 years for a CGI dinosaur movie. (That’s one year more than the gap between Tim Burton’s last Batman and Christopher Nolan’s first, by which time everyone was salivating for another “dark” Dark Knight.) But there’s also something more interesting at work here. Jurassic World director Colin Trevorrow did as skillful a job as anyone of navigating the commercial and editorial strictures of the Reboot Era. What was his magic formula for success? Massive spoilers ahead. Kneel at the altar of source material. The key word here is first film. Trevorrow is reverent toward the original movie — which takes place, like Jurassic World, on Isla Nublar — rather than its lesser sequels. It’s the same way J.J. Abrams has pledged his loyalty to Star Wars’ original trilogy but, at least obliquely, not the prequels. It’s both sensible and a way to make common cause with the fanboys. Recast the first movie’s memorable villains. The revelation of Jurassic Park was the velociraptor: a brainy, man-size killing machine that had never been in our toy chests because, well … the velociraptor wasn’t really a brainy, man-size killing machine. How do you bring the raptor back for a fourth go-round? Trevorrow and his co-screenwriter Derek Connolly landed on what we might call the Terminator 2 solution: Recast the raptor — at least for important chunks of the movie — not as the heroes’ antagonist but as their ally. This allows you to revisit an old friend. In a weird way, it also allows the old friend some measure of redemption. Fill the movie with Easter eggs. Jurassic World contains a ridiculous number of references to, and quotations from, the first movie. My partial list would include: Mr. DNA strand. Bugs in amber. A book jacket in the control room featuring Michael Crichton. A computer jockey dinged for having a messy workstation (what a complete slob). Said jockey wearing Clubmaster glasses and sporting a vintage JP T-shirt. Blue-gray helicopters. A goat offered as a sacrifice to a Tyrannosaur. Old-school JP road signs. “Spare no expense.” A famous actor who narrates the park’s ride-along tour. Park workers filling the role of the Easily Killable Guy that porters used to fill in jungle movies. Phones and radios that conveniently go dead during a crisis. A park magnate who is a humanist but only so much so. Flares waved at the marauding Tyrannosaur. Etc., etc., etc. If you ransack the extended universe of Jurassic Park (does JP have an EU? ), you can find more. The notion of a kid riding a triceratops like a Shetland pony figured in the concept art of the initial film. As did the Epcot-like look of the park, with buildings arranged around a pyramidal structure. 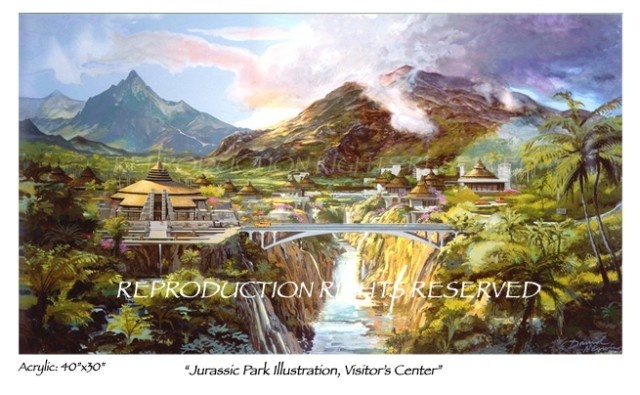 There were aviary and waterfall scenes and tennis courts in Crichton’s Jurassic Park novel. Dinos were capable of camouflage in Crichton’s The Lost World, which also featured characters riding motorcycles among velociraptors. (In that book, Crichton rejected the idea of a Tyrannosaur whose visual acuity was based on movement, but never mind.) That Jurassic World’s Simon Masrani would eventually pilot a helicopter was as inevitable as The Lost World’s Kelly Malcolm finding a bar on which to practice her gymnastics. Vincent D’Onofrio’s Vic Hoskins is really Lew Dodgson cross-bred with Richard Perle. And if we’re being completists, we might note that Omar Sy’s Barry stuffing himself into a hollow log to avoid a raptor is rather like Muldoon’s escape in the first novel, when he stuffs himself into a drainage pipe. This kind of deluge is a feature of the Reboot Era. We live in a time when scripts don’t so much feature Easter eggs as the Easter eggs drive the script. The old Saturday Night Live bit about Trekkies shouting impossibly nerdy questions at William Shatner is no longer a joke. This is now the conversation the filmmakers have with the audience. Show fans something teased but not delivered in the first movie. Another standby of the Reboot Era. Prometheus delivered the fabled Space Jockey; the Star Wars prequels the Clone Wars; the J.J. Abrams Star Trek the Kobayashi Maru. 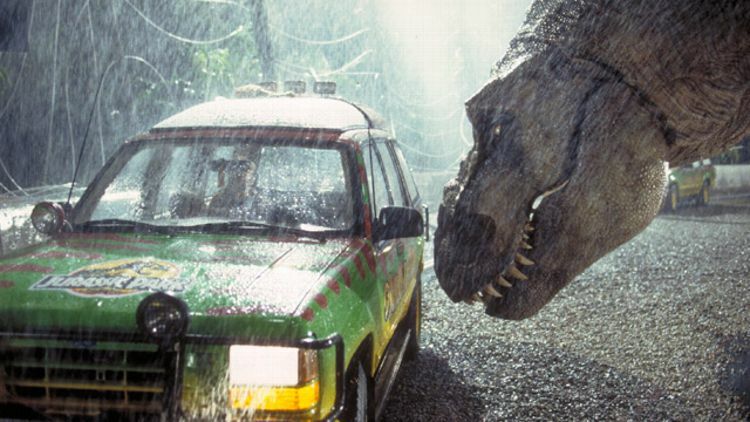 What fangirls and -boys never got from a Jurassic Park movie was a fully functioning park — “the realization of John Hammond’s dream,” as Trevorrow put it. Here it is. The famous John Williams score swells not at the sight of a living dinosaur (been there, done that) but during a camera glide through Dino Street, USA. The gyrosphere ride lets you gambol among the stegosaurs and trikes. A kind of refitted army troop carrier lets you run with Gallimimus — another nod to the original movie, by the way. Don’t make a new film; remake the first film. As Ian Malcolm and Ellie Sattler had it: Man destroys God. Man creates dinosaurs. Dinosaurs eat man. Universal inherits the earth. With a few minor twists, this is the plot of Jurassic World just as it was the plot of Jurassic Park. As Grantland’s Wesley Morris noted, Trevorrow kept intact the standard Spielbergian separated-families motif. He even reheated the finer points of the first movie’s climax. At the end of Jurassic Park, the heroes are saved by the marauding Tyrannosaur, who happens to wander into the visitor’s center and pick off the velociraptors. Jurassic World brings back the T. rex (“We need more teeth”) and adds another surprise intervention — a deus ex Mosasaur. The filmmakers decided, correctly, that people basically weren’t that interested in a new movie. They wanted to watch Jurassic Park again. Overlay the reboot with a hip, slightly jaded view of pop culture circa 2015. I know this lament. Trevorrow and I are both late-thirties fanboys who’d like to think our childhood movies were more pure and less cynical than the greasy cash grabs that followed. As it happened, 1993’s Jurassic Park was corporatized up to its dilating pupils. The Chicago Tribune interviewed an expert who predicted that the movie’s 1,000 licensed products would generate $1 billion in revenue, about as much as the movie made at the box office. 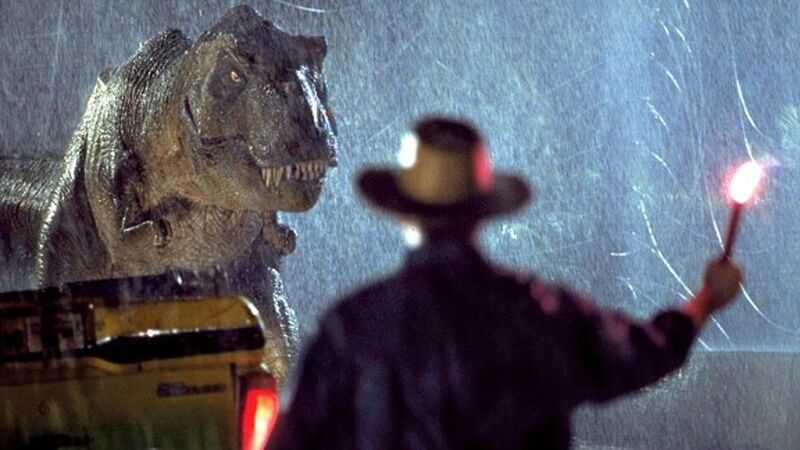 A New York restaurateur claimed producer Kathleen Kennedy nixed her menu’s “Jurassic cheesecake” because the restaurant didn’t make like McDonald’s and officially license its dino-size fries. Yes, there were Pepsisaurs and Tostitodons — as Jake Johnson’s Lowery has it — back in the ‘90s, too. Trevorrow is on much more solid ground with his riff on how hard it is to thrill people these days. 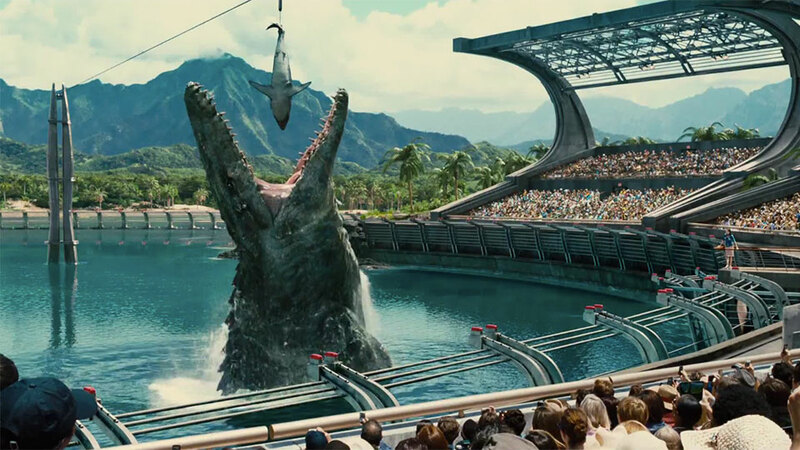 Jurassic World’s money shot is of a shark — a stand-in for the analog star of Jaws — being swallowed by a CGI Mosasaur. The park’s keepers talk about how hard it is to impress audiences. “Let’s be honest,” Bryce Dallas Howard’s Claire Dearing says. “No one’s impressed by a dinosaur anymore.” The movie’s older kid-in-danger, Zach (Nick Robinson), first buries himself in his phone rather than watch a dinosaur; when he’s finally impressed, he doesn’t enjoy the creature. He films it. Display a mild queasiness with the amount of CGI in the movies. J.J. Abrams got a big cheer at the recent Star Wars Celebration Anaheim when he said he was committed to practical effects. George Miller won plaudits for sticking real trucks in the desert in Mad Max: Fury Road. Similarly, Trevorrow gestured to the Precambrian world of special effects by filling his movie with rubber dinos, an old View-Master, and going to the mat to force Universal to pony up for an animatronic apatosaurus. Chris Pratt’s Owen Grady tenderly ministers to the old girl before her death — a symbolic death of the practical effect under the rampage of CGI. There is, of course, no going back. Upon seeing the CGI dinos of Jurassic Park, the effects master Phil Tippett said something like, “I think I’m extinct.” But it’s another imperative of the Reboot Era to nod to this vanished world. As Trevorrow told Ain’t It Cool, “It is a self-aware movie.” Today, directors make movies that self-consciously acknowledge that they’re killing off the techniques that made the magic of their childhoods. It’s like Skynet gaining consciousness and then apologizing for wiping out the human race. All of this may make Jurassic World sound like a cynical exercise, designed to pluck certain nostalgic chords. It is. But given the gantlet it had to run, given Spielberg’s heavy hand on Trevorrow’s shoulder (Spielberg is said to have had final cut of the movie), it’s a minor miracle that Trevorrow pulled it off. When the Tyrannosaur roared at the end of Jurassic World, the little boy inside me choked up a bit. It was a self-aware kind of choking up, the kind you get when a filmmaker has stuck a shock prod into your vulnerable underbelly. But whether you’re 16 or 38, a dinosaur park is still a dinosaur park. Dr. Malcolm, we’re home!